Connected sensors and devices are a pervasive reality, as we interact more or less knowingly with smart items every day. While smart-phones represent the main Internet connected devices which people interact with during their daily lives, other intelligent items are at our disposal and they are so integrated with the environment that we fail to notice them. Animals too participate in this relatively new phenomenon, as the use of subcutaneous chips to identify and track them are widely used. In the modern era, where each item and living being (animal or human) is or can be connected to others and share data, the Internet of Everything has become a new buzz-world, and great attention has aroused for the huge variety of possible applications of such technologies, together with concerns regarding privacy and security. 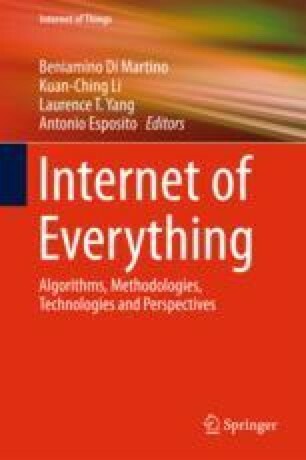 In this chapter we introduce the concept of Internet of Everything and we focus on some of the specific technological areas which fall under this wide category. Fitbit official site for activity trackers and more. https://www.fitbit.com/. Accessed Jan 2017. GE digital wind farm. www.gerenewableenergy.com/wind-energy/technology/digital-wind-farm.html. Accessed 20 Mar 2016. Judge, J, and J. Powles. 2015. Forget the internet of things we need an internet of people. https://www.theguardian.com/technology/2015/may/25/forget-internet-of-things-people. Accessed 20 Mar 2016. Nike+ Fuel band. http://www.nikeplus.com.br/. Accessed Jan 2017. The industrial internet consortium. http://www.iiconsortium.org/. Accessed 20 Mar 2016.